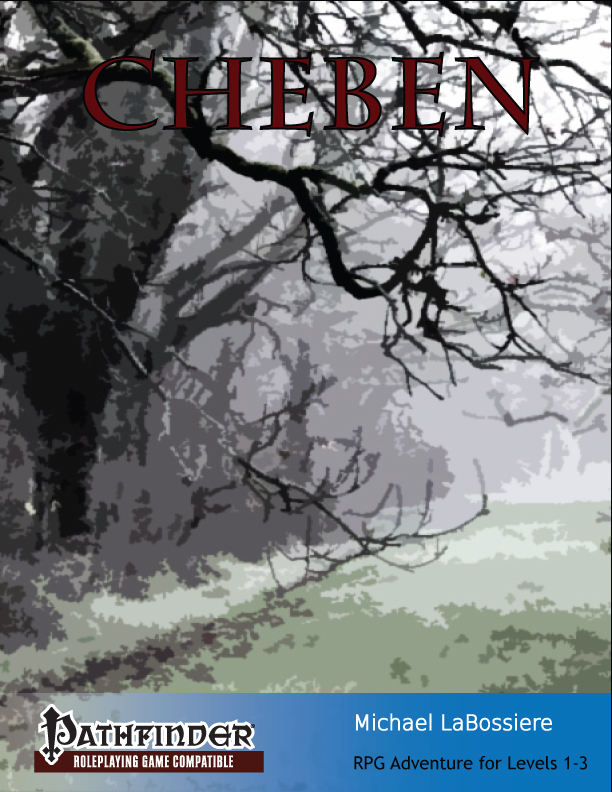 The good folks of Cheben have four problems they need solved. To start things off, the dead have been walking about in the old graveyard and scouts have reported seeing something else skulking around the old mausoleum. Good Father Rollin would go deal with them himself, but he is busy ministering to the spiritual needs of the community. Second, goblins have been spotted near the old auxiliary armory and it is feared they might have set up a base of operations on the island. The militia would handle the problem, but the mayor worries that the goblins might be engaged in a ruse to lure away the defenders of the town. Third, an area of woods near the town is permanently in shadow, no doubt due to magic of some sort. Two hunters have gone missing in the woods and others have reported siting strange creatures in the woods. The town wizard would deal with this, but he is busy with critical research, which leads to the final problem. Kosven, the town wizard, needs some brave souls to investigate an old and abandoned library. The library has reputation for being haunted and no one in the town wants to face what lurks within its walls. As usual, it is up to starting adventurers to solve the villagers’ problems. Or die trying. Cheben is a Pathfinder Role Playing Game compatible adventure. It is intended for a party of 1st-3rd level characters. New Monsters (Paper Phantom, Silent Guardian (Least), Rage Wolf, and Whip Plant). A complete campaign starter adventure with four distinct adventure areas.